This Easy Peach Rhubarb Pie Recipe combines the scrumptious flavours of both rhubarb and peaches together to make ONE amazing pie! 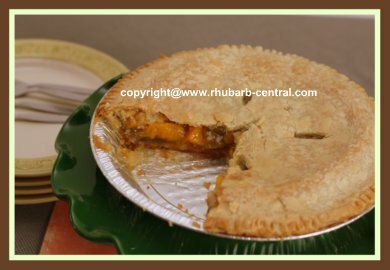 You can use fresh or frozen rhubarb for this recipe and ONE CAN of sliced peaches! ... no need to wait until peaches are in season - make this recipe with homemade canned peaches, or store-purchased canned peaches! If you DO have fresh peaches on hand, of course they would be perfect to use (sliced) too! I used 2 purchased pie crusts to make this pie, one for the bottom, and one for the top! 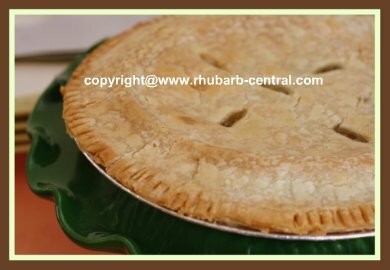 If you are using home-made pastry, your pie will probably taste even better ... but this one was REALLY mouth-watering good - and the easiest rhubarb pie I've made! Drain the peaches, reserving about 2/3 of the syrup. Chop the peaches into smaller pieces and place them in a bowl, and add the syrup, chopped rhubarb, sugar, coconut, corn starch and vanilla. Line a 9" pie plate with the bottom pastry and add the filling (above), then dot with the butter (divided into small pieces). Top with the remaining pastry, flute edges. I like to add a pie crust shield after the pie has been baking in the oven for about 35 minutes (see below). 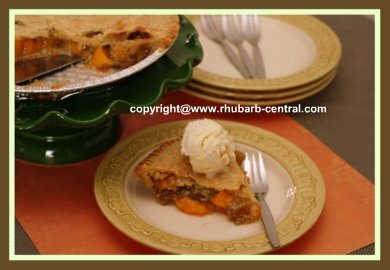 ENJOY this delectable, easy peach and rhubarb pie! 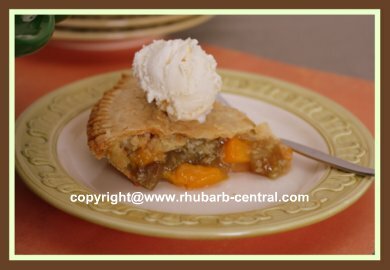 Visit my "sister-site" Peach-depot.com for hundreds of easy peach recipe, a website devoted to only peach recipes! Now that you've created a delicious pie, be sure to give it the presentation it deserves! 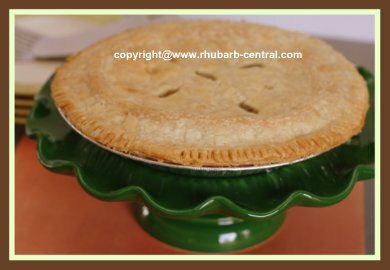 Do you ever have problems with the edges of the pie crust becoming too dark or burning in the oven, when the filling of the pie is still not done?